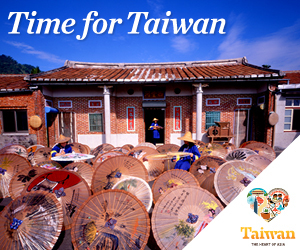 Taiwan is a visually fascinating island with the wonderfully convenient characteristic of having a diverse visual landscape contained within a small and accessible geographical area. At approximately 36,000 square kilometres—about the same size of Vancouver Island—Taiwan is really quite small, geographically speaking. And yet Taiwan is full of enough landscape variance to make it feel infinitely larger than it actually is, with wonderfully diverse national parks, endlessly sunny beaches and a culture that seems to emanate from the earth. It’s actually quite convenient that Taiwan is the size it is. For exploration on a timeline, in comparison to a country like Canada where immense stretches of land separate the really unique geographical areas, Taiwan is an ideal choice. 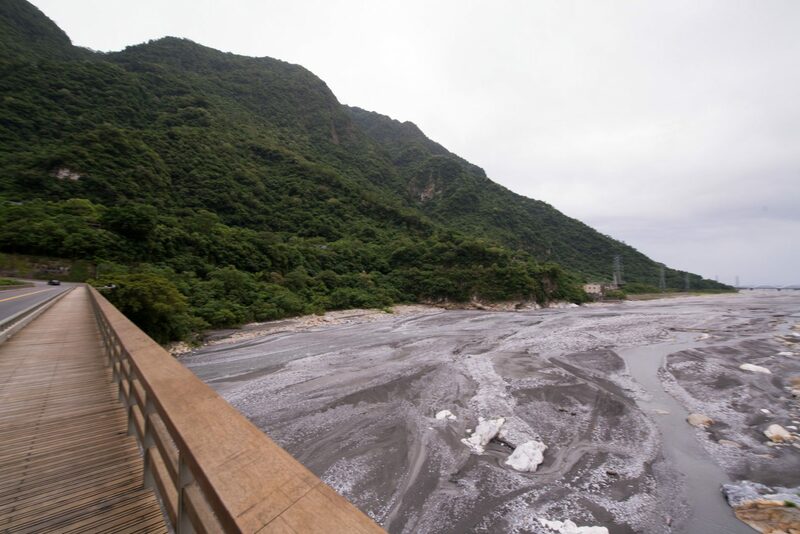 To see anywhere close to the variety of landscapes I saw in Taiwan would require me to book an extensive and time consuming tour of Canada—and even then I would not get the tropical beaches of Taiwan. During our 10-day expedition across Taiwan, we were able to cover almost the entirety of the island, from the north, down the east coast, and back up again on the west coast. Our opXpeditions Taiwan expedition not only took us across the entire geographical perimeter of the island, but also allowed us to pass through almost all of the landscape variation on the island: from the ultra-modern and bustling metropolitan area of Taipei, to the surreal rock and marble masterpiece of Taroko Gorge, to tropical beaches, coastal cliffs, mountain jungles and the lush, pristine forests of Sandiaoling. The trek to the Sandiaoling waterfall was our first booted foray on the island. We headed an hour east of Taipei, where the landscape morphs into a sweeter, simpler time. The skyscrapers fall away and vast expanses of farmland and forest seem to stretch on forever through a magnificent valley. Unexpected villages pop up, with rivers gently snaking through the clusters of clapboard buildings. This 13-kilometre stretch from Taipei into Yilan County is called the Pingxi Branch Rail Line, and you can ride the whole route in about an hour. Originally constructed during the region’s coal boom, the train has been preserved as a beautifully quaint scenic route, and it took us to one of the best day hikes on the island. Team Outpost overlooking Sandiaoling Waterfall after our trek up. We hopped off at the idyllic village of Sandiaoling Station, and from there simple wooden signs pointed us to the beginning of the hike. It’s a gentle uphill trek to start, as the trail climbs higher and higher into the woods. For the most part, the path is fairly easy, though the mood of the forest changes dramatically with the weather. 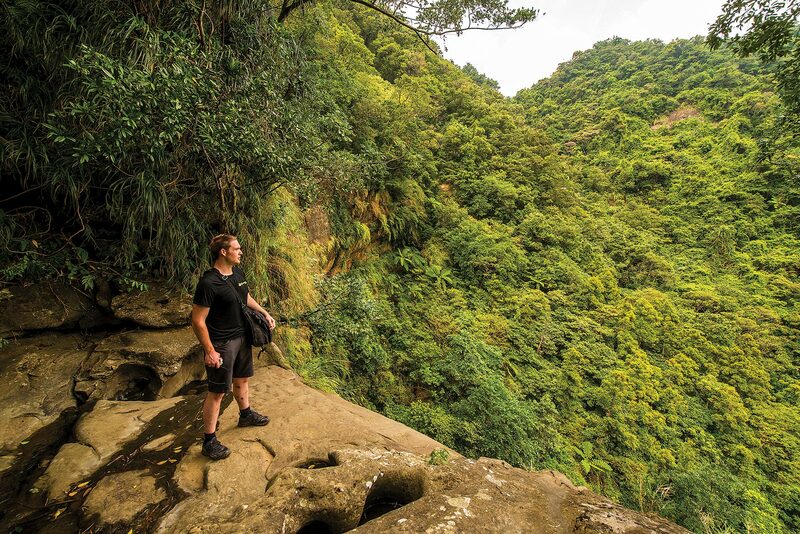 During typhoon season, heavy rains can make the trail slippery, causing the deceptively simple uphills and downhills to become slick and muddy—but the upside is more voluminous waterfalls than after a dry spell. Our trek began just before a storm rolled in, and as we hiked we could sense the winds gathering momentum, a growing urgency in the hoots and chatters of forest residents, the suspension bridges swaying and creaking as we crossed. The most challenging part of the hike is a series of nearly vertical log and rope ladders embedded in a sheer rock face—especially if it’s wet, and even more especially when burdened with heavy camera gear! There are four waterfalls to see on this hike, each with its own temperament, and curious nooks and crannies to explore. The first half hour of the trek will take you to Hegu Falls, a multi-tiered waterfall with an easily accessible viewing platform. Hike for another half hour and you’ll come to Motian Falls, where you can wade right out into the rocky stream below, perch on a boulder and enjoy the cooling spray on your face (or blinding, thundering shower, depending on how much it’s rained). At Motian, we ventured to a cave directly behind the falls, a haven formed by an outcropping in the cliffs, and watched the rushing water tumble down 30 feet below us. Shortly after that is Pipa Dong Falls, and then my favourite—Shifen Falls, where we stood awestruck in a river on the edge of a massive cliff, revelling in the exhilarating views of the valley. From Shifen, we turned around and hiked back out the way we came, racing ahead of the impending storm. Our trek had totalled three incredible hours. Great trekking infrastructure means you can easily explore much of the island by foot.